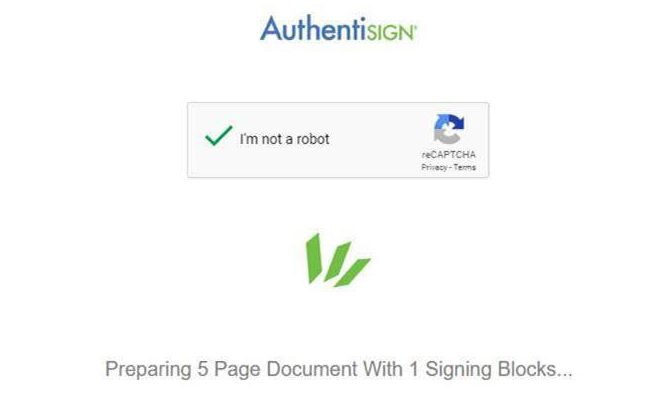 Effective today, all Authentisign users (both NorthstarMLS subscribers and their clients), will be required to check a simple checkbox labeled “I’m not a robot” before each Authentisign document they open to sign. You will likely recognize this from other web applications as it has become a very common and effective strategy to increase security and ensure the app is dealing with an actual user. Instanet has put this checkbox in place to resolve a long-running issue for many users and their clients (especially those on Microsoft Office 365 and MSN email) that was causing very slow performance or inability to execute an e-signature. All you (or your client) need to do is click (or tap) the check box to confirm “I’m not a robot”. Once you’ve checked the box, you’ll be taken to the same signing page as you’re used to seeing. If you have questions or issues, contact our Help Desk at help@northstarmls.com or 651-251-5456 (toll free 1-877-251-5455), M-F, 8:00 to 5:00.